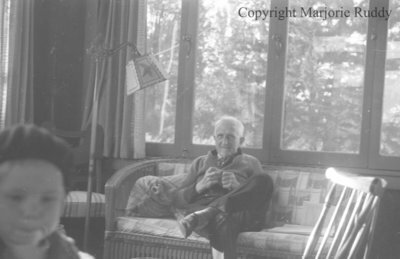 A black and white negative of Mr. Frank Lloyd Beecroft sitting on a wicker couch in front of a row of windows. The is an unidentified child in the front of the photograph. Frank Lloyd Beecroft was born at Saintfield in Reach Township on February 16, 1868. He worked on his father's farm until 1886 when he attended Lansdowne Model School and Jarvis Collegiate. He attended the British American Business College and went into the dry goods business in Toronto. He joined the Timothy Eaton Company in 1889 and was in charge of the mail order department for 13 years. In 1903 he went into the housing business in Toronto. In 1918 he moved to the Grange property in Whitby and in 1921 purchased the lumber yard formerly owned by Richard Oke on Pine Street. He continued with this business until 1938. Mr. Beecroft served two years on the town council and 15 years on the Whitby Board of Education. For 30 years he was Recording Steward of the Methodist Tabernacle and later Whitby United Church. He died at Whitby on April 13, 1963 and is buried at Mount Lawn Cemetery, Whitby. Frank Lloyd Beecroft, c.1938, Marjorie Ruddy. Whitby Archives A2013_040_865A.